(Bloomberg) — Fill Rover’s bowl with crickets and Asian carp, and keep the grass-fed beef steaks for yourself — it’s better for the environment. So says Nestle SA’s Purina, which is experimenting with a new line of pet food featuring untapped ingredients like insects and invasive fish species. 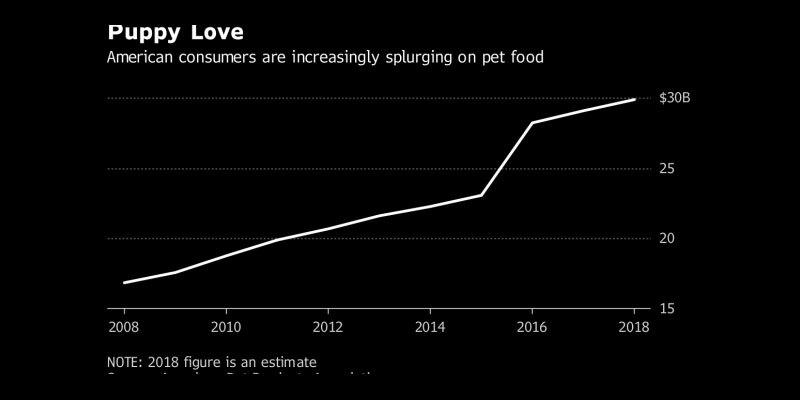 The menu goes against the grain in the $90 billion business, whose growth has been driven by dog and cat owners serving up meals that increasingly resemble their own — including organic, grain-free, vegan and even “human-grade” options. Those new-age recipes may sound more appetizing than traditional pet food, made up of all the bits and byproducts people didn’t eat that are ground up and pressed into morsels to disguise their provenance. There’s just one problem: The richer diets take a higher toll on the planet, too, conflicting with the food industry’s push for sustainability. Other big players are upping the ante. Last year, General Mills inc. splurged $8 billion on Blue Buffalo Pet Products, while J.M. Smucker Co. bought Ainsworth Pet Nutrition for $1.9 billion and Amazon.com Inc. started Wag, its own brand of pet products. Each of them offers recipes aimed at the premium pet-food consumer, including grain-free formulations and proteins normally seen on fine-dining (and log cabin) menus, like venison and wild boar.